1Set the Mode dial to Auto. This lets the camera know you want autofocus. 2Set the lens focusing method to auto. You make this shift using a switch on the side of the lens. Set the switch to A. 3Looking through the viewfinder, frame your subject. 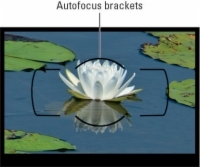 Make sure your subject appears within the autofocus brackets. 4Press and hold the shutter button halfway down. Exposure metering begins. 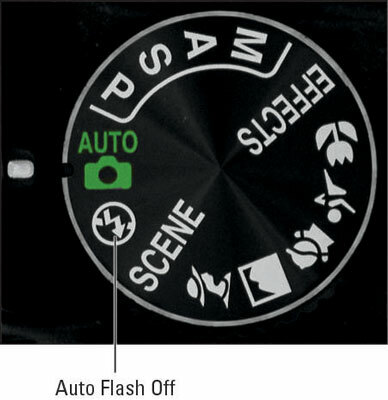 The autoexposure meter analyzes the light and selects the initial exposure settings. The camera continues monitoring the light up to the time you take the picture, however, and may adjust the exposure settings if lighting conditions change. The built-in flash pops up if the camera thinks additional light is needed. If you’re in a situation where flash is prohibited, return to Step 1 and change the Mode dial setting from Auto to Auto Flash Off. This shooting mode does the same thing as Auto but disables flash. The autofocus system begins to do its thing. In dim light, the AF-assist lamp may shoot out a beam of light to help the camera measure the distance between your subject and the lens so that it can better establish focus. 5Check the focus indicators in the viewfinder. When the camera has established focus, one or more of the focus points turns red for a split second. 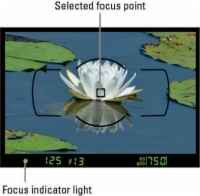 The red focus points represent the areas of the frame used to set the focusing distance. Then a single black focus point appears. 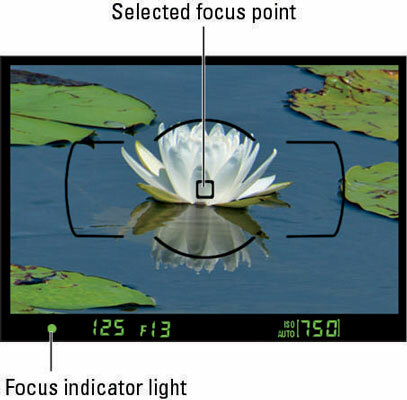 At the bottom of the viewfinder, the focus indicator lights to give you further notice that focus has been achieved. If the subject isn’t moving, autofocus remains locked as long as you hold the shutter button halfway down. But if the camera detects subject motion, it adjusts focus up to the time you press the button fully to record the picture. 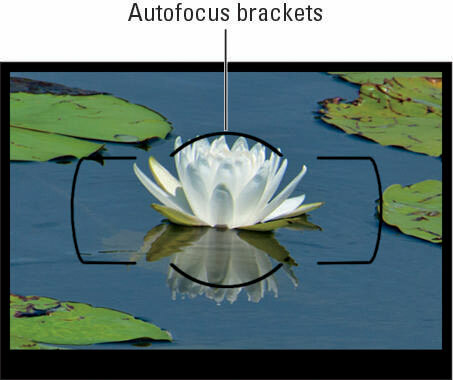 As your subject moves, keep it within the autofocus brackets to ensure correct focusing. 6Press the shutter button the rest of the way to record the image. If the camera refuses to take the picture, don’t panic: This error is likely related to autofocusing. By default, the camera insists on achieving focus before it releases the shutter to take a picture. You can press the shutter button all day, and the camera just ignores you if it can’t set focus. Try backing away from your subject a little—you may be exceeding the minimum focusing distance of the lens. If that doesn’t work, the subject just may not be conducive to autofocusing. Highly reflective objects, scenes with very little contrast, and subjects behind fences are some of the troublemakers. The easiest solution? Switch to manual focusing and set focus yourself. While the camera sends the image data to the memory card, the memory card access lamp lights. Don’t turn off the camera or remove the memory card while the lamp is lit or else you may damage both camera and card. When the recording process is finished, the picture appears briefly on the camera monitor.